Habitat use at fine spatial scale: how does patch clustering criteria explain the use of meadows by red deer? Large mammalian herbivores are keystone species in different ecosystems. To mediate the effects of large mammalian herbivores on ecosystems, it is crucial to understand their habitat selection pattern. At finer scales, herbivore patch selection depends strongly on plant community traits and therefore its understanding is constrained by patch definition criteria. 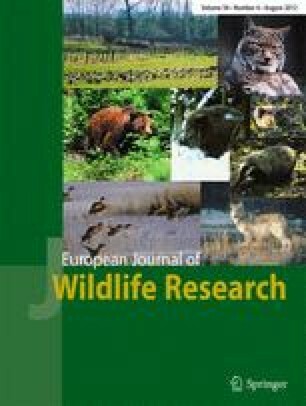 Our aim was to assess which criteria for patch definition best explained use of meadows by wild, free-ranging, red deer (Cervus elaphus) in a study area in Northeast Portugal. We used two clustering criteria types based on floristic composition and gross forage classes, respectively. For the floristic criteria, phytosociological approach was used to classify plant communities, and its objectivity evaluated with a mathematical clustering of the floristic relevés. Cover of dominant plant species was tested as a proxy for the phytosociological method. For the gross forage classes, the graminoids/forbs ratio and the percentage cover of legumes were used. For assessing deer relative use of meadows we used faecal accumulation rates. Patches clustered according to floristic classification better explained selection of patches by deer. Plant community classifications based on phytosociology, or proxies of this, used for characterizing meadow patches resulted useful to understand herbivore selection pattern at fine scales and thus potentially suitable to assist wildlife management decisions. The online version of this article (doi: 10.1007/s10344-012-0612-8) contains supplementary material, which is available to authorized users. Annalisa Bellu was financed by a PhD grant from Fundação para a Ciência e a Tecnologia (SRFH/BD/24134/2005), within the programme of National funds of the Ministério da Ciência, Tecnologia e Ensino Superior (MCTES). The authors would like to thank two anonymous reviewers for their valuable comments on a previous draft of the manuscript. Supplementary material, approximately 91.5 KB.